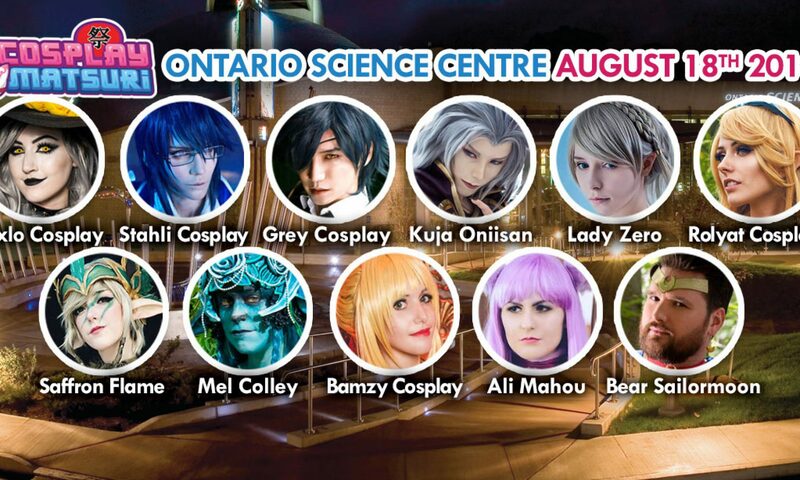 Cosplay Matsuri returns to the Ontario Science Centre this August 18th 2018! I WOULD LIKE TO TAKE PICTURES/VIDEO OF THE SHOW AND ATTENDEES/COSPLAYERS. IS THAT OK? Generally, it is acceptable to take pictures/video to document your experience. However, if you wish to take pictures of a particular cosplayer or group, it is common courtesy to ASK permission before doing so. Please remember that Cosplay is NOT Consent and cosplayers have the right to refuse their picture being taken. I AM BEING HARASSED OR FEEL CONCERNED THAT ANOTHER ATTENDEE/COSPLAYER IS IN AN UNCOMFORTABLE SITUATION. WHAT SHOULD I DO? Cosplay Matsuri has a ZERO tolerance policy for harassment of any nature, physical or verbal. If you feel you are being harassed or witness another attendee/cosplayer being harassed, please bring it to the attention of a Staff member IMMEDIATELY. Situations will be assessed and dealt with on a case by case basis. I HAVE A QUESTION. WHO CAN I TALK TO FOR ASSISTANCE? Please feel free to approach any Staff member. Staff will be posted at most entry and exit points. WHERE CAN I BUY TICKETS? WHERE DO I LINEUP WHEN I ARRIVE? We encourage everyone to pre-register and take advantage of discounted pricing. On the day of the event, please follow the signs to the reg/pre-reg desk. You may also ask any Staff for directions and they will be happy to assist. I PURCHASED A TICKET AND SOMETHING CAME UP. IS A REFUND AVAILABLE? Early Bird Tickets can be refunded until June 30th, after which refunds are no longer available. Pre-Registrations can only be refunded at the Ontario Science Centre, there must also be a valid reason for the return. Tickets Purchased at the day of the event are non-refundable. Yes! Passes will be sold at the registration desk on the days of the event. Please go to the Registration line to register and receive your pass/wristband. ARE THERE CHANGE ROOMS/FACILITIES FOR COSPLAYERS? If you are entered into the Masquerade, you will be directed to the appropriate rooms prior to the contest to change or make any adjustments to costumes. There are also several washrooms that can be used throughout the venue. I WOULD LIKE TO CONDUCT A PANEL. HOW DO I SUBMIT A PANEL RECOMMENDATION? Awesome! We welcome panel suggestions. Please fill out the Panel Suggestion form located on our here. I WANT TO ENTER THE MASQUERADE CONTEST. WHERE CAN I FIND INFORMATION? Please refer to the Masquerade Registration form on the Masquerade details page. IS THERE PARKING AT THE ONTARIO SCIENCE CENTRE? ARE THERE PLACES TO EAT AND GRAB SUPPLIES? There is paid parking at the OSC but we enourage you to look for alternate parking in and around the general area. There is Street Parking as well as other areas if you look carefully. There is also a number of restaurants and shops in the Plaza across the street. The wristbands provided are very durable and should only be removed if you no longer intend on coming back to the show floor. Incidents of a broken or lost wristband will be dealt with on a case by case basis at staff discretion. There is NO guarantee the wristband will be replaced. DO I HAVE TO BRING A PRINTED COPY OF MY TICKET? CAN I SHOW YOU MY TICKET ON MY MOBILE? If you pre-register for tickets, you will receive an e-mail with a confirmation as well as a barcode. You do not need to have a printed copy of your ticket (even though it is appreciated if you do). We can check you in by scanning the confirmation barcode on your mobile device. IS THE ONTARIO SCIENCE CENTRE WHEELCHAIR ACCESSIBLE? Yes. Both the OSC is wheelchair accessible.